Make sure that you can get replacement bearings before you take on the job of replacing worn ones. They should be available from an auto-electrical store. Starter-motor bearings are usually bushes made of graphite-bronze. A few starters - especially heavy-duty types - have ball bearings at the pinion end. With the starter motor removed from the car, but before you dismantle it, check whether the bearings are worn. Grip the pinion and push the shaft sideways, if possible at both ends. It should not move. It may move a little lengthways called 'end float'. The maximum allowable end float is 3 mm. Some Lucas starters have a riveted cover over the bush at the commutator end. You have to punch or drill the rivets out. Buy new rivets (some kits of replacement parts include nuts and bolts instead). Dismantle the motor (See Stripping the starter motor) and take off the endplates to remove the bearings. Remove the brush assembly from the commutator. These are exactly like starter-motor bearings, usually with a ball bearing at the pulley end. 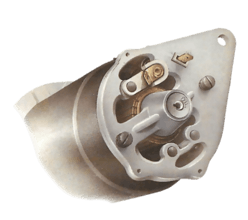 Use these instructions for removing and replacing both dynamo and starter-motor bearings. Always repolarise a replacement dynamo or one that you have been working on before fitting it. Do it with the dynamo bolted in place, but before connecting it up. Connect a spare length of cable to the 'live' battery terminal, then connect the other end for just about two seconds to the F (field) terminal on the dynamo. Afterwards connect up the dynamo in the normal way and test. Tap out the bush with a hammer. Always force out bushes inwards. Some bushes have collars and can move only one way. The new bush must be pressed in from the inner side of the endplate. Split the bush with a chisel and lever it out with a screwdriver. The most straightforward way to remove a bush is to stand the endplate, inner side down, across a vice with the jaws open just wide enough for the bush to pass through. Tap it out with a hammer, using a rod or a socket spanner as a drift. If the bush will not budge, cut into one side of it with a small chisel, and split it down its length. But take care not to damage the soft alloy housing. Another way is to screw a suitably sized thread-cutting tap into the inner side of the bush until it takes a firm grip, then pull tap and bush out together. The new bush should be a tight fit in the housing. Soak it for 24 hours in oil before pressing it in. The bush may also be tapped in, using a socket as a drift. Be sure to keep it straight. The bush should be a loose fit on the armature shaft, but with no perceptible play; and the shaft itself must be unworn and free from grooves and gouges. Press the new bush in with a vice, making sure it is aligned in the housing. The easiest way to fit the bush is to press it home in a vice. For this you also need some sort of tool, the same diameter as the bush, to bear against the end of it while pressing - a socket spanner or a piece of rod or tubing of the correct size will serve. Line up the bush absolutely square with the housing before pressing it in. An out-of-line bush will distort, even if you can push it fully home. Take care, too, that the end against which you are pressing is not damaged or distorted. Another way to fit the bush is to tap it gently in, again using a socket spanner of the same size to protect the end. Take out the circlip with a small screwdriver. The inner race of the bearing is a tight but sliding fit on the armature shaft. Tap the bearing out, using a socket as a drift. Another way is to grip the front plate in a vice, or support it on blocks to tap the armature shaft from its bearing. Either way, take care not to let the armature fall as it comes out of the front plate. There are several ways in which the bearing is retained in the front plate. Usually, however, it is held by an internal circlip or by a small riveted-on retainer plate. Punch or drill rivets out of the retaining plate. Take care to keep the drill vertical. If the bearing is held in by a circlip, remove the clip with circlip pliers, or by easing it out with a screwdriver. Take out any spacers or felt washers there may be underneath it - but note the order in which they were fitted and put them back the same way later. You may need to renew a felt washer. Use a punch or a drill to take the rivets out of a retaining plate. Again, there may be washers which must be replaced in the correct order. Put back the spacers and felt washer if they were fitted, and replace the circlip or retaining plate. Splay out the rivets properly when replacing a retaining plate, so that it is secured firmly to the plate. With the bearing fitted, tap the assembly back on to the armature shaft, using a length of tubing that just fits over the shaft to drive the bearing home.